We are deeply disappointed that the Department has proposed to adopt the weaker of the two options it introduced in the ongoing negotiated rulemaking to restrict arbitration agreements used by schools that receive Title IV funds. The Department’s preferred option does not fully preserve students’ rights to seek civil remedies for fraud or other wrongdoing and does not give regulators tools needed to oversee schools’ use of federal funds. Its preference for the weaker option is also inexplicable in light of the overwhelming support, voiced at the Department’s negotiating session yesterday, for adopting a stronger proposal on arbitration to protect students and the federal investment. First, the proposal preferred by the Department permits schools to force students to arbitrate individual claims and claims brought by groups of students who do not seek to certify a class. Suits on behalf of a group of students are common in cases involving students who have been victimized by fraud. 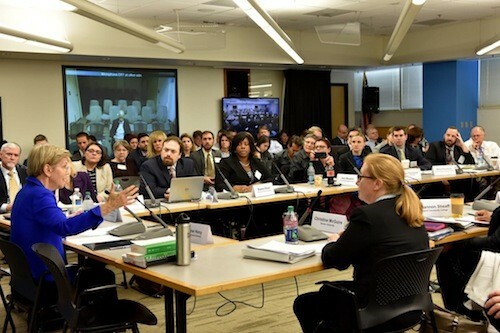 The current Department proposal will result in more borrower defense claims than the stronger option supported by veterans, consumer, and student advocates because the proposal will enable schools to continue to force non-class claims into arbitration, where students are less likely to recover and more likely to face bias. Second, the proposal preferred by the Department also does not clearly cover claims related to a school’s advertising, marketing, recruitment, and enrollment activities—precisely the activities that trigger many claims against schools. The proposal extends only to claims that relate to the making of a federal loan or the provision of educational services financed by that loan. As negotiators told the Department yesterday, the proposed language may be interpreted to exclude claims frequently brought by students over fraud in recruitment and enrollment. Third, the proposal continues to permit schools to use mandatory arbitration clauses for non-class claims that include provisions to deter students from bringing their claims. Schools could continue to use mandatory arbitration clauses that impose on students high fees and limit an arbitrator’s ability to award damages or injunctive relief. There is no good reason to reject the stronger of the two options initially proposed by the Department. The Department has an interest in ensuring that students who are victims of fraud have the ability to go to court, whether or not those students choose to litigate as part of a class, with a specific group of classmates, or individually. If a student and school believe that arbitration is a mutually beneficial way to resolve a dispute, the stronger of the two options allows them—after the dispute arises—to agree to arbitrate.